Micho in action during one of Uganda Cranes encounters. Courtesy photo. FOOTBALL– Uganda Cranes Coach Milutin ‘Micho’ Sredojevi? has rebuffed reports that he is resigning his job after the Africa Nations Championship (CHAN) qualifier game between Uganda Cranes and South Sudan on Saturday. This followed social media rumours that the Serbian tactician was bringing the curtains down to his illustrious four-year stint at the helm of Uganda Cranes. 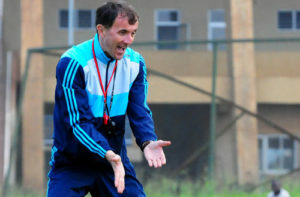 After guiding Uganda Cranes to their elusive maiden Afcon appearance since 1978, Micho enriched his status as one of the most sought after tacticians on the African Contient. Since then, he has been heavily linked with a number of coaching posts, such as Ghana, Nigeria, South Africa and South Africa. The Serbian, who replaced Scottish Bobby Williamson in the April 2013, is much and is said to be contracted with FUFA until 2019.